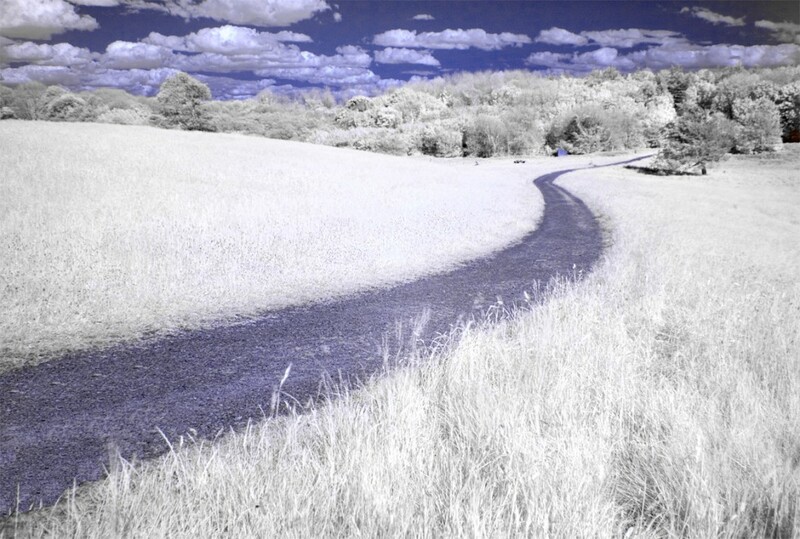 This infrared photograph was taken at Renville Park, Oranmore Co. Galway. The public park is now maintained by Galway County Council but was previously the demesne of Renville House. Although now ruined, Renville House (also know as Rinville House) was built in 1820 as a three-bay, two-storey over basement house with a recessed central bay, a central Wyatt window and had a striking portico. The estate was originally owned by the Lynch family of Rinville. In 1629 Edmond Athy married Margaret Lynch, daughter of Phillip Lynch. As Phillip had only his daughter as heir, the Lynch name was retained as a condition of inheritance. This was the beginning of the Lynch-Athy family line at Rinville. The Athy and Lynch families were two of the original ‘Tribes of Galway’, a group of fourteen merchant families who came to dominate all aspects of life in the city of Galway between the 13th and late-19th centuries. The Lynch-Athys lived in Rinville Castle, a 16th century tower house built on the grounds of the estate until Rinville House was built in 1820. The tower house still stands in Renville Park and is in very good condition. A Phillip Lynch Athy is recorded as being the resident proprietor of Rinville House in 1824. The Griffith's Valuation of the 1850s shows Phillip as owning 1684 acres of land around the Renville and Oranmore area which was valued at £1,271. By 1855 the ownership of Rinville House had passed to Randal Athy, although large portions of the estate were advertised for sale in the Encumbered estates court in 1857. In 1906 Rinville House was owned by Edmond J. Athy and was valued at £43.